Her father – Oswaldo Paya – was a leading figure of Cuba’s underground opposition movement. After being persecuted all his life by the political police, he was killed in 2012 in a mysterious traffic incident on the island, which survivors, witnesses, and fellow dissidents assure was no accident. Four years later, 27-year-old Rosa Maria Paya remains undaunted in her journey to show the world the truth about her father’s death, seeking an open and independent investigation of the incidents, so that for once and for all, she says, the Cuban government can be held accountable for taking his life, as well as the life of Harold Cepero – a family friend who was also killed on that July afternoon. This past 24th of of February, Rosa addressed the 2016 edition of the Geneva Summit for Human Rights, demanding the international investigation, dismissing the image of a more open Cuban government as false, assuring that Cubans have the right to be free and to vote, and making it clear that, although international forums are important venues through which human rights can be defended worldwide, that Cubans do not want international organizations or governments to solve their problems, but that solidarity and coherence with those who struggle for freedom is important. “Thank you for this opportunity to spread the voice of the Cuban people. Cubans have lived for nearly 60 years without the freedom to express our own voice. The revolution of 1959 immediately suppressed freedom of speech, freedom of association, freedom of movement, as the authoritarian tools to remain in power forever. These suppressions came with repression and violence, as illustrated by the long list of extrajudicial killings perpetrated by the Cuban authorities. At this moment, I would like to take a second to remember and honor the memory of Orlando Zapata Tamayo, political prisoner who died exactly 5 years ago during a hunger strike in a Cuban prison. My prayers are also for the 4 innocent pilots from the organization Brothers to the Rescue, shot down over international waters by the Cuban military on February 24th – 20 years ago. Now, on February 2016, the same violators of human rights are still ruling on the island. Even more dangerous, this corporative and military elite is involved in a fake transition – not to democracy, but to legitimize their total control upon the Cuban society with a renewed image for the international public opinion, in order to attract foreign investors and financial credits. This combination of the worst of communism and the worst of consumerism is leading my country into a dynastic state capitalism – a Castro capitalism, like my father, Oswaldo Paya, warned in a book that will be published very soon. It is a system where the historical generation and their descendants have monopolized all the economic resources of Cuba, while they keep sequestered the political sovereignty of our citizenry, condemning an entire people to economic and social scarcity, because the absence of human rights prevents Cubans from managing themselves. Is this the Cuba where the European Union and the United States expect to make profits? Maybe with the justification that, at some point, there will be an empowerment of the civil society? This empowerment hasn’t happened, not because of foreign policy, but because of a totalitarian state that does not recognize legal personality to any Cuban citizen, and therefore no one can belong to or own a business, or belong to a civil association, or to a political party, other than the Communist Party. We do not believe that what has not happened in China or in Uzbekistan during decades is now magically going to happen in a dictatorial Cuba. My father, Oswaldo Paya, founding leader of the Christian Liberation Movement, and winner of the Sakharov Prize of the European Parliament, denounced this operation of the regime as the “fraudulent change”. He paid with his life for his peaceful activism to achieve the real rights that belong to the Cuban people. On July 22nd 2012, my father and my dear friend Harold Cepero where extrajudicially executed by agents of the political police, staging a car crash that never took place in a location of Cuba that is still to be determined. [The Cuban government], not satisfied with this double crime, my family was threatened with death and forced into exile, in order to safely carry on our lives and struggle for a free Cuba. But we do not belong in exile, and I refuse to remain in exile, treated as a stranger by the Cuban government and their despotic bureaucracy, including their new embassy in Washington DC, where they didn’t even open the door for me. Next February 29, my father would have been 64 years old. Our friends and I, in person, will be there back in Havana in a thanks-giving Mass for his life. Death is not more powerful than love, and the legacy of my father Oswaldo Paya and Harold Cepero is full of love for life in a free Cuba. Many Cuban lives are still at risk. This is why we are now trying to open an independent investigation to stop the impunity, to find out how my father Oswaldo Paya and Harold Cepero were murdered in Cuba. A special report was released by Human Rights Foundation where all evidence indicates that this was a crime against humanity, with the involvement of the Cuban authorities. We will never give up on justice. Because we deserve justice. And because there cannot be reconciliation without the recognition of the whole truth. And a nation that intends to forget the violence against its innocent people will remain a captive nation. And it will be a nation condemned to suffer such violence over and over again. Sadly, Cuba is now the country that many Cubans do not want to experience. My people are selling their houses to escape to Central America, or boarding a raft to reach the United States. But I’m not here just to tell you about our tragic history – I’m here to ask you to support the Cuban people in our struggle to change our history. Today, it is my honor to be a part of the Latin American Youth Network for Democracy. We coordinate efforts in 20 countries to preserve and rescue the democratic values that have been compromised in many parts of our continent, because of corruption, because of authoritarianism, but also because of the interference of the Havana regime, as in the case of Venezuela. It is time for Cubans to decide our own destinies and to stop being the subjects of official agendas and secret pacts between governments. It is time to put an end to the impunity of the Cuban government, which has never been chosen by Cubans in free, fair and pluralistic elections. This is why more and more Cubans are now saying “yes” to a citizen initiative that claims for a plebiscite in Cuba, through a national and international campaign called Cuba Decide. Totalitarian and post-totalitarian systems cannot coexist with the idea of the people deciding by themselves, and this is precisely what Cuba Decide stands for. In order to initiate a true transition on the island, Cuba must open to our own citizens who have the right to decide the system we want to live in, after almost 60 years of uncontested government. In this, we need all your support, to spread the liberation message of Cuba Decide and for all Cubans, finally, to decide our own future. But by democratizing our country, we do not become another failed corrupt nation. This fatalism is another fallacy of the regime – a lie repeated by many academics of the free world. Let me tell you that, as a young Cuban woman, me, and many like me – we are now struggling to live and love in a decent, inclusive, and prosperous 21st century society. Please join us in this effort to return sovereignty to the citizenry. To give power to the people, and not to the powerful. The last iron curtain must fall, and it must fall now. “Freedom is indivisible, and when one man is enslaved, all men are not free”, said President John F. Kennedy in his speech at the Berlin Wall. “Dictatorships do not have political colors, they are just dictatorships”, said my father. Until his life was taken, from him and from all Cubans. Dear friends, the Cuban people are not a monolith to the image and likeness of the Communist Party, the only one [that is] legal according to the current Constitution. In this new era of normalizations with Cuba, the table of negotiation should contribute to a true transition and not to the interest of a General in power. We Cubans do not need the European Union or the United States to solve our problems. But we need them to be coherent and support the right to decide of the Cuban people through a plebiscite, using all the channels available. We are Latin Americans, but we believe in the best principles of North America, too. We are [from the] Caribbean, but we stand for the best values of Europe, too. We are Cubans, but we are with Asians and Africans struggling for a better life. Despite the rhetoric of a reactionary regime, let us not forget that we Cubans are not less than human. And each and every one of the Universal Human Rights applies to us as much as it does to anyone in the world. No man is an island, and no nation is an island. As my father used to say, help us to globalize solidarity, or human rights will always be in danger. God bless you all, thank you so much”. Users of Twitter have planned a ‘virtual protest’ on the social network for this Friday, June 20th, starting at 9 AM, in solidarity with jailed Cuban rapper Angel Yunier Remon (“El Critico”) who will stand trial that same morning in the Eastern town of Bayamo, Cuba. The protest is open to all users of Twitter who’d like to participate and will consist of messages using the hashtag #FreeElCritico, created to raise awareness of the musician’s situation. Remon, a member of the censured rap group “The Unwanted Children”, was jailed in March 2013 for producing anti-government music and for publicly voicing his pro-freedom ideas. 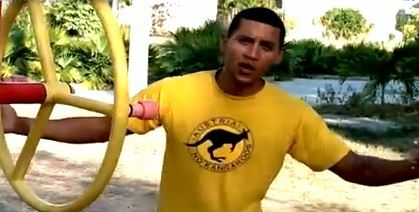 Cuban authorities accused the rapper of “attempt” and “public disruption”, though they have failed to provide any proof (a common practice against those who dissent with the regime on the island). Now, Angel Yunier may be sentenced to 8 years behind bars, despite already having been kept for over a year in several prisons without having had a trial and subjected to several beatings at the hands of guards. El Critico’s wife, Yudisbel Roseyo, recently explained that the authorities haven’t informed her of a specific time in which the trial against her husband will take place, except that it will occur sometime on Friday morning. Join the call and Break the Silence! One of Venezuela’s best known opposition leaders, Maria Corina Machado, and other female activists called on Venezuelan women to participate in a march under the slogan #WomenForLife scheduled for 10 AM this 26th of February. The purpose of the march is to “silently and peacefully march” to the headquarters of the National Guard in Caracas to demand justice for the many students and activists who have been detained, mistreated or killed for civically demonstrating out on the streets against the current regime. 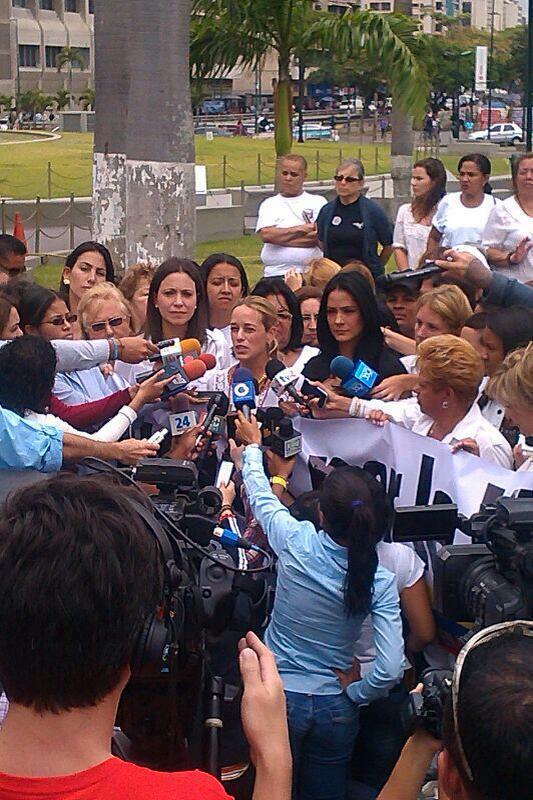 Machado and other known figures such as Lilian Tintori, wife of recently imprisoned opposition leader Leopoldo Lopez, and actress Norkys Batista took part in a press conference on Monday in the capital city of Caracas to announce the details of the march, which is being promoted through Twitter and other social media outlets with hashtags #WomenForLife and #26F (the latter making reference to the date of the demonstration; February 26th). The organizers of the event are asking “mothers, grandmothers and sisters” to participate and to wear white during the march. This call to action surges amid days of street protests carried out mainly by students who oppose the current regime in Venezuela led by Nicolas Maduro. Forces of that same government have used street thugs and armed officials to violently attack the demonstrators, already causing more than 13 confirmed deaths and numerous injuries. Many others, including known opposition members like Leopoldo Lopez, have been imprisoned. “In all of Venezuela, we will walk dressed in white, and in silence, to the headquarters of the National Guards to challenge the military personnel to stop the violence”, tweeted Maria Corina on her account (@MariaCorinaYA). (Bayamo, Cuba) – A group of more than 10 guards from the Las Mangas Prison of Bayamo, alongside State Security and Ministry of Interior officials, savagely beat jailed dissident rapper Angel Yunier Remon Arzuaga, best known by his artist name “El Critico”. The violence occurred on Sunday, February 23rd, confirmed Remon’s wife, Yudisbel Roseyo Mojena, a victim of constant persecution as well. The imprisoned musician – a member of the underground hip hop group “Los Hijos Que Nadie Quiso” (The Unwanted Children) – has been carrying out a series of protests from prison, refusing to shave his facial hair and writing words like “change” and “freedom” on his sheets. However, on the 23rd, guards and other security officials used blades to forcefully shave his beard, causing him several cuts, says Yudisbel. After this incident, “the more than 10 officials beat him and shouted offenses at him, ordering him to stop his protests”, adds the young wife. El Critico’s response was that he’d rather die in the struggle than give in to the demands of the Cuban regime. The rapper was jailed on March 23rd of 2013 after a series of police home raids, beatings and short detentions in his hometown of Bayamo. State Security agents accuse him of “attempt” although the reason behind his imprisonment is his protest music and having placed several signs with anti-regime messages in public. He has not had a trial and has been in a judicial limbo for what will soon be a year. Remon is also denied medical attention, despite suffering from chronic gastritis, and is barred from family visits. His actions of not shaving (and occasionally carrying out hunger strikes) is to protest the unfair and false accusations against him. On her part, Yudisbel Roseyo is also the victim of frequent persecution, as she is arrested mostly on Sundays for participating alongside the Ladies in White in marching to morning Mass to pray for the freedom of Cuba’s political prisoners, her husband among them. She too has been beat, offended, detained and deported by State Security officials. 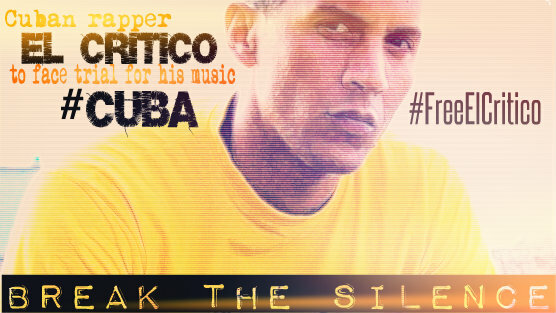 Activists and bloggers have continued to use #FreeElCritico on Twitter and other social networks as part of a digital campaign to demand the immediate release of the Cuban rapper. Angel Yunier Remón Arzuaga, the rapper best known as “El Critico” who has been unjustly imprisoned in the Eastern town of Bayamo since March 2013, has not received medical attention after carrying out a 27-day long hunger strike and being returned to Las Mangas Prison, despite suffering various health complications, among them chronic gastritis. In addition, this week penal authorities suspended family visits for the young musician. Yudisbel Roseyo, wife of Remon, informs in the following audio that the suspension of the visits took place after he refused to shave his beard as a sign of protest and after he painted his sheets with the word “change”. On her part, Roseyo has been victim of arrests each Sunday for trying to make it to Catholic Mass along with other Ladies in White in Bayamo. Recently, she was kept in a bus under the sun for various hours and this 1st of December her home was stoned by political police officials. These tactics did not impede her from stepping out of her house, and upon doing so she was arrested and physically assaulted by police agents. Both Roseyo and Remon Arzuaga have been threatened by the regime to not continue with their posture in favor of freedom but both have reiterated that they will keep doing what they have done until now, despite the consequences. On Wednesday, November 20th, renown dissident Sara Marta Fonseca Quevedo, from Havana, sent out a message through “Radio Republica” so that members from all opposition organizations in and out of Cuba raise their voices and carry out activities to demand the liberation of political prisoner Marcelino Abreu Bonora who is currently suffering in the Arnaldo Milian Castro Hospital of Santa Clara, Villa Clara, in a hunger strike which has already lasted more than 60 days. Fonseca, who serves as the spokesperson of the OZT National Resistance Front and one of the leaders of the Pro Human Rights Party of Cuba, as well as a member of the Ladies in White, highlighted in the audio that no person should be taken behind bars because of their ideas, explaining that this is precisely what has happened with Abreu who was jailed after handing out pro-freedom pamphlets in the Cuban capital (Havana). Afterwards, State Security fabricated a crime of “attempt, resistance and damages to a door lock” against the dissident. His time in prison has been in the central province of Villa Clara but due to his severe health situation during his prolonged hunger strike he has been taken to the hospital. Sara Marta also sent out a message on her Twitter account (@SaraMartaCuba) calling on Cubans from around the world and from all social networks to join the call of solidarity with Marcelino Abreu, asking them to use the hashtag #FreeMarcelino on Twitter. Almost immediately, a number of Twitter users, bloggers and activists began to Re-Tweet and share Fonseca’s message and convoked a Tweet-Protest for this Friday, November 22nd starting at 9 AM using #FreeMarcelino to raise awareness on the situation of this dissident who is in very “grave” condition, according to relatives and fellow opposition members. Similar protests have successfully taken place and have garnered massive participation in days past with the cases of dissident rapper Angel Yunier Remon ‘El Critico’ (#FreeElCritico), the Lady in White Sonia Garro (#FreeSonia) and the case of Cuba’s election into the UN’s Human Rights Council (#DontVoteCuba). Other dissidents currently in and out of Cuba have also been rallying support for the liberation of Marcelino, including José Daniel Ferrer García, Jorge Luis García Pérez ‘Antúnez’, Carlos Michael Morales Rodríguez, Ricardo Lázaro Fiallo López, Damaris Moya Portieles and Anyer Antonio Blanco Rodríguez, among many others. All of the previously mentioned have described Abreu’s case as “urgent”. The young activist is a member of the Orlando Zapata Tamayo Hard Line and Boycott Front.